Cosmetic Dentist Dr. Nugent uses white fillings (also called composite or resin fillings) at his Pasadena, Texas Dental Office. White fillings are actually boned to your teeth. This allows Dr. Nugent to be much more conservative when removing cavities. 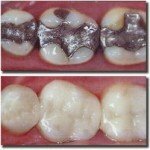 Patients love that fact that they do not have to have ugly black fillings. White fillings look and feel natural. So go ahead and smile and laugh, your white fillings will be invisible. Love your new cosmetic white fillings with Dr. Nugent.